Tell us about the various mediums you work in and what inspires you. I work in acrylic paint, Prismacolor archival color pencils, water soluble graphite and digital photography. I am inspired by what I see in my environment and the process of the application of the mediums I use. In my abstract work it is mostly the process of application that informs the work. What do you consider to be some of your greatest strengths and weaknesses? My greatest strength is that I have continued to make artwork regularly for almost 50 years. My greatest weakness is that I have so many interests in different media and techniques that my art may not seem like a cohesive body of work when viewed casually. Although much of my work is abstract (mostly painting) and another equally large body of my work has imagery (figure drawings and mixed media landscape and figure pieces), what holds the entire body of work together is my attention to the “mark” in the application of each medium. I feel that drawing is the most important skill an artist can learn. Drawing teaches the artist to see accurately and to transpose a three-dimensional object into a two-dimensional surface. I draw from the human figure two to three days each week even though my painting has been mostly abstract for many years. It helps me to focus and articulate what I am painting. I fear that many people do not take the time to “experience” artwork in a gallery. They identify with the image and then go on to the next piece. It is my hope that viewers will look closely and try to understand the process that went into the making of each piece and reasons that I took the time to paint them. Creative art viewing should be a forensic experience. What is your personal vision for your work? I am not a conceptual artist. My artwork continually unveils itself through the process of making art. Each stroke or mark informs the next. It is a bit like a chess game. As the marks fill the canvas, the rules of the game are unfolded. If I am true to this process and don’t take any easy way out, this process can lead to the painting evolving into new and exciting directions. This expectation of something new is why I love painting. I am the co-founder and was the executive director of Unison Arts Center in New Paltz for over 35 years. During that time I continued to do my artwork and show regularly in solo and group exhibitions. Since leaving the staff of Unison over a year ago, I have been able to spend unlimited time in my studio and promoting my career as a visual artist. I have shown several times in the past year at many of the better galleries in the area. My website has been kept updated with new work and information about upcoming shows. I now have an artist’s agent and an involvement with an online gallery. Tenacious. When I get started with a project, for better or worst, I will stick with it. Fifty years of painting and over 35 years building Unison Arts Center are examples. What is your personal definition of art? Art at its highest level is being fully conscious of life’s experiences and being able to articulate that experience accurately into an art form. Drawings, mostly figure drawings and some landscapes, and maybe a few ideas for new painting directions. Probably no words. What art do you have hanging on your walls at home? Our walls are full. My wife and I have acquired many small works of mostly local artists. I have been lucky enough to find a few wonderful pieces in yard sales, including a drawing by Kirschner, and lithographs by Larry Rivers and Rafael Soyer. The rest of the walls are filled with my work. How does your background contribute to your process as an artist? The college that I graduated from was very much out of the Black Mountain College lineage and I owe my attention to detail and the “process” of art making to that. The process of doing art and the hope to find something new in that process. Stuart Bigley studied at the Corcoran College of Art and graduated from Silvermine College of Art. Bigley has exhibited his work in solo and group shows at various galleries in the Hudson Valley, Washington and New York City. What may come as an equally exciting surprise to the average visitor to this exhibition is how beautiful these works are, because many of us know Stuart Bigley primarily as the man behind the art – the impresario rather than the creator. For folks from New Paltz and beyond who rely on Unison as our reliable hometown source for great music, theatre, visual arts and workshops in everything from figure drawing to firewalking, Bigley’s friendly grin as he introduces the featured performers has been an intrinsic part of the experience ever since the arts center was established. 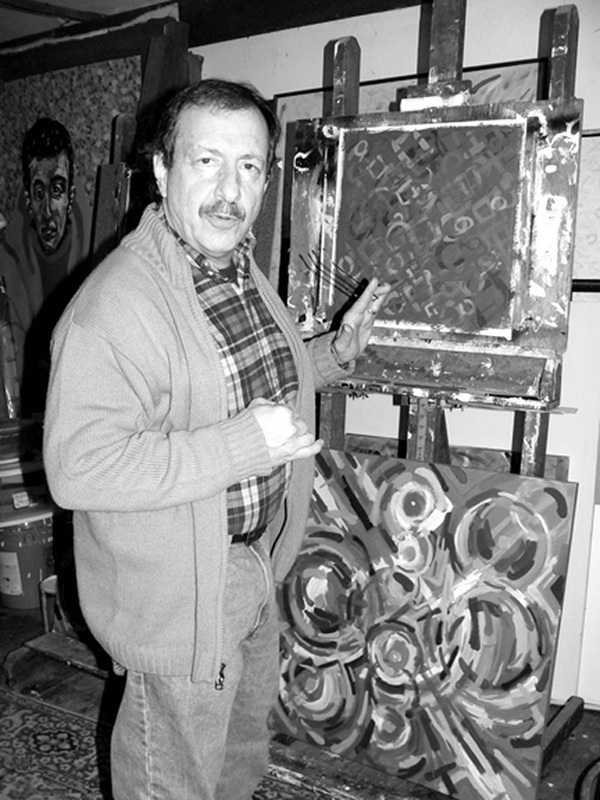 But unbeknownst to many, he’s also a serious working artist, having trained at the Corcoran College of Art and graduated from Silvermine College of Art and shown his works widely throughout the Northeast. Bigley co-founded Unison with Peter Pitzele in the mid-‘70s, became executive director in 1980 and served in that capacity for over 30 years, booking performers, promoting shows and somehow raising enough funds even in lean times to keep this grassroots-grown community treasure afloat. He then went through a transitional period as artistic director, finally stepping down altogether when Christine Crawfis came aboard as executive director in 2012. Check out Bigley’s website at www.stuartbigley.com for a taste of what’s in store at this exhibition, which will stay up through the end of July. He’s religious about figure drawing and totes a camera on his world travels, but Bigley has an exquisite sense of color, the combinations that he selects pleasing to the eye even when they seem a bit counterintuitive. His paintings in the past couple of decades have been mostly nonrepresentational, yet they present an irresistible temptation to discern figures in the swirling patterns of brushstrokes: some elusive animal camouflaged by wind-tossed grasses, perhaps. Many of the canvases suggest cave art or petroglyphs, or calligraphy in some not-yet-invented alphabet. Patterns of scattered orbs suggest molecules and solar systems. One of his newest mixed-media works is titled Abstraction on Lights in a Tunnel 2, but its cascading ribbons evoke the Aurora Borealis or strands of DNA. 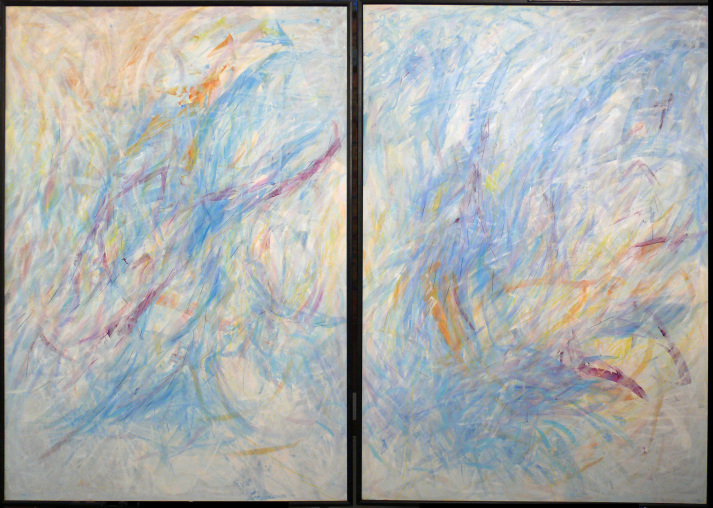 Many of the works are intended to be hung as pairs, but although a few are genuine diptychs, more fall into relational categories that Bigley refers to as “siblings” or “cousins.” He’ll work on two at a time, building up a layer on one and then switching to the other for a while, using the same palette. Sometimes he’ll then scrape swaths of paint away, creating undulating patterns of texture that you want to reach out and touch. His painterly oeuvre as a whole is simultaneously sophisticated and accessible, vibrant and delicate, pulsing with life and motion, singing to the unconscious with the fluid symbology of dreams. “Five Years Later: Works by Stuart Bigley” opens with a reception from 4 to 6 p.m. on Sunday, June 2. Admission is free. Unison is located at 68 Mountain Rest Road in New Paltz, just a short hop west of the Wallkill. For more info call (845) 255-1559 or visit www.unisonarts.org. “Five Years Later: Works by Stuart Bigley” opening reception, Sunday, June 2, 4-6 p.m., free, Unison Arts & Learning Center, 68 Mountain Rest Road, New Paltz; (845) 255-1559, www.unisonarts.org. Quirky? Maybe, especially in the way he tips his head sideways in reply to my questions, as if the answers may be in me. Stuart Bigley could have written portions of the Earth Charter. He is that smart and that awake. He is an artist. Now I’m confused. Should I write about this or about that? It’s easy enough to recapture a day at Unison Art Center, an hour with Stuart Bigley talking art, a brief walk to the Center where I join up with a group of artists, the Gallery committee, to discuss upcoming exhibitions. Finally, there is a “thank you” reception for Unison volunteers, with tasty morsels and more art talk. I wonder, should I write an essay - with chapters? Never mind. Let’s just mention that, in fact, Stuart Bigley in the late 1970’s dreamt up an art community, with his friend, Peter Pitzele, Peter withdrew in short order, Stuart purchased the property and continued to craft it into what it is today: a major Northeast performing, exhibiting, and teaching center featuring artists from around the globe. Executive Director and Artistic Director seems full time to me, but Stuart is also an active participant in both his painting studio and evening modeling sessions at Unison. How does he manage all this stuff?